As health supplement to help support growth and development of teens. May help boost immune system, enhance mental development, and promote linear growth. 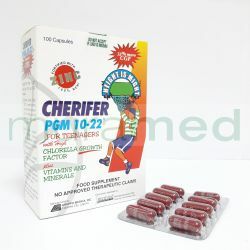 Chlorella Growth Factor (CGF) 200 mg, Zinc (elemental) 9 mg, Taurine 200 mg, Vit. A (equivalent to 578 mcg RE) 1,925 IU, Vit. D (equivalent to 5.25 mcg) 210 IU, Vit. B1 1.80 mg, Vit. B2 1.95 mg, Vit. B3 24 mg, Vit. B6 1.95 mg, Vit. B12 3 mcg, Folic acid (equivalent to 417 mcg DFE) 250 mcg, Vit. C 97.50 mg, Iron 17 mg, Calcium phosphate 150 mg, Magnesium oxide 7.5 mg, Copper sulfate 1 mg.